HISTORY: Sara Lov and Dustin O'Halloran comprise the atmospheric, lush sounds of Devics. Hailing from Los Angeles, Devics arrived on the indie-rock scene in the early 1990s with their own label, Splinter Records and were joined by a multitude of incredible musicians along the way. In 1996, the band self-released their debut album, Buxom; two years later, If You Forget Me... appeared. In 2000, they released The Ghost in the Girl EP which showcased the band's musical growth and Bella Union was impressed. Devics inked a deal with Bella Union and issued My Beautiful Sinking Ship in 2001. After several tours in Europe, The band grew a fondness for Italy and moved there in 2001 where they wrote and recorded two album The Stars at Saint Andrea in 2003 and Push the Heart in 2006 both released on Bella Union in Europe and their own Splinter Records in the US. Devics never officially broke up, but have remained inactive. Dustin & Sara continue to work on music both in their solo careers and together and hope to eventually make another Devics album. MEMBERS: formed in 1993 by Sara Lov (vocals) and Dustin O'Halloran (guitar/piano/vocals) in Los Angeles. Joined later by Evan Schnabel (drums) who appeared on the first 3 albums and subsequent tours but left the band in 2001. He was never officially replaced. The band were joined by various drummers on tours and albums including Scott McPherson, Davey Latter, Scott Mathers, Michael Jerome, and Francesco Donadello. 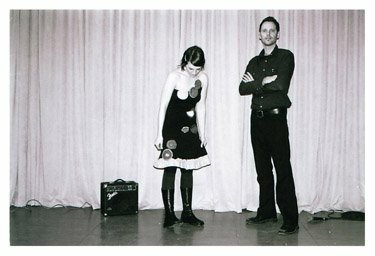 Sara Lov played bass on the first two albums until Ed Maxwell joined on the upright bass in 1999. Ted Liscinski joined in 2002 as a second bass player and he also played keys and guitar. They were often joined on tour by various rotating musicians including Simon Raymond on bass, Scott Mercado on keys, bass and guitar.